It's National Poetry Month, and one of my theories is that a good poem can lift an author past any tedious touch of "writer's block" to a fresh outlook. Even for mysteries. Floridian David Kirby makes this very clear in his new book via Hanging Loose Press, A WILDERNESS OF MONKEYS. In long-lined swinging stanzas the narrative almost scoots past the presence of meter and line -- and then, swinging back the other way, Kirby's merriment restores the form and its rhythm, with a gurgle of delight. them say "you missed a patch over there" and not tip you. Think it's easy to pull this off for almost 90 pages? It's not easy at all. But it's wonderful, and funny, and fun, and thoughtful. I'm so glad this book arrived in the mail. It was a great surprise. And it's available now. Vermont's a funny place. You can see the most amazing creations made from barn board or blue and green Mason jars or sprays of pussywillows dominating a room or a landscape. But you can't necessarily get the TV stations that show the "DIY Network" -- you have to DIY, that is, Do It Yourself, yourself. 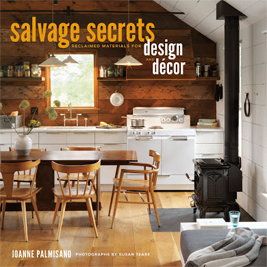 Which makes it a little bit wild and wonderful that Joanne Palmisano's new book, SALVAGE SECRETS DESIGN AND DECOR, found its way here to Vermont for a review. Crammed with tips like the importance of the depth of a salvaged sink, or how to refinish metal cabinets -- "Easy! Take it to your local car refinisher, and have them sandblast it and repaint it. Unique and ready to go -- just pull up a truck" -- Palmisano sets this cheerful "make it into something fresh" attitude into style that fits as well in an urban upscale home as it does in a chic country cottage. A star of the television DIY network, she's less well known here among the Green Mountains, where her roots are. And she deserves a lot more local attention. This sleek and colorful book packs 302 pages (you'd never guess it from the comfortable feel in your hand) with finished projects, inspiration, and highly personal adaptations. I'm especially impressed with the bathrooms Palmisano shows, which are true sanctuaries (one is even decorated with old church crosses). But the kitchens and dining areas are wonderful meetingplaces, and the bedrooms are cozy and funky. I did wonder how the lovely golden lighting in so many of these set pieces will adapt to the push into compact fluorescent lighting. If I ever meet this Vermonter-turned-national phenom of reclaiming and recycling, I'll hope for a long conversation on the topic. Meanwhile, I plan to re-read and re-gaze at least a few more times; Susan Teare's photos are crisp, large, and lush, and Palmisano's friendly and down-to-earth approach to savoring design and decor makes for great reading. Oh no, this isn't a mystery book -- I'm sure you caught that! -- but even though I told the very nice publisher's rep not to send a review copy because it wouldn't fit with our mysteries focus, one arrived in the mailbox a week later. And you know how it is in Vermont ... we hate to waste things. Palmisano captures that philosophy with exuberance and skill (and a great "Resources" section); what a shame it would be if I didn't put her new book to use right here! Available in May, and by pre-order now, through independent bookstores and online. Here's Palmisano's website: http://joannepalmisano.com. Have fun visiting, and I hope you'll pick up a copy of her book, as well as tuning in (if your TV can reach it) to her DIY shows and her designs on This Old House. In a couple of years, I might wear out my copy of the book, and if I do, I'll create a project to showcase it. Yes, it's worth holding onto this one, reclaiming it with fresh eyes and appreciation every season. But just in case you DON'T yet have some of these books on your shelf: THE CAIRO AFFAIR is an excellent place to start. Like Charles McCarry's excellent (and sometimes little known) espionage title The Secret Lovers, this title is meant to read two ways. 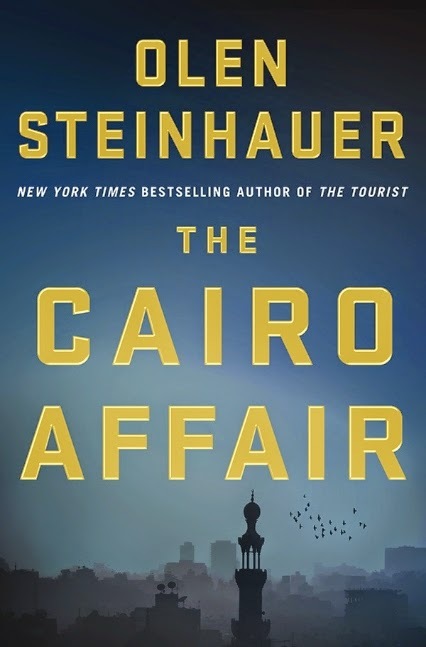 It's first a political snafu in Cairo, Egypt, and Steinhauer's lively and quick-paced novel takes us into the heart of the Arab Spring: Libyan terrorists, religious conflicts, power struggles. Why should any of it be connected to the sudden shooting, in public, of Sophie Kohl's American diplomat husband in Hungary? Well, our sins have long roots. And chopping off the stems doesn't stop the roots from traveling onward and sending up more shoots, right? Sophie's just been confronted by her husband Emmett and, with little fuss, admitted to an affair in their last posting, in Egypt. (Second meaning of the title.) She sees no direct connection to the murder that's just happened in front of her, but then again, she's got to start somewhere, responding to what's happened. She wasn't going to do anything that she'd done before in her life. Emmett had been too good and too strong, and she would try to at least be something better than she had been. She returned to bed and picked up her cell phone, again turning it on. It was three thirty in the morning, and there were twenty-eight missed calls. Mother, father, friends, unknown numbers, and, twice, Stan Bertolli. Dependable Stan. She pressed the green button to call her old lover in Cairo. Steinhauer packs in some stunning twists, as well as suspense and enough different views of the roles of the United States in northern Africa that the Arab Spring takes on fresh aspects and layered depth. The book spins to a highly satisfying conclusion. Of course, I ended up with many more questions about the state of the world, lingering, sticking with me, and then pushing me to the Sunday newspaper with fresh eyes and rekindled curiosity. Kimberly Pauley shouldn't need much reassurance -- her track record (mostly for teens) already shines and sings. But her author website (http://www.kimberlypauley.com) has the feel of someone still hesitant to trust the fates. She should probably just relax and enjoy what she's earned. 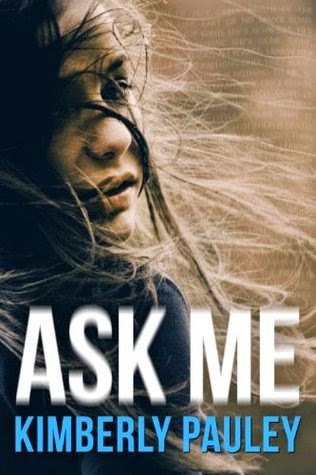 ASK ME is a tight, intriguing, and totally teen-ready mystery with just the right amount of paranormal and a balanced blend of not belonging and suddenly finding a first boyfriend. Or two. Right from the start, it's clear Aria has a "gift." Her grandparents, who gave up their comfy retirement home in order to find a more rural place to raise her after her mom deserted her, know she has this "prophecy" ability. It's no surprise: So did her grandmother when she was a girl (in that case, the gift ended at puberty, though). And Aria's grandfather is still hopeful that this newest truth-speaker in the family will find a way to persuade the unruly prophetic streak to come up with something to help the household finances ... say, the winning animal at the races. But prophecy, for this line of "Sibyls," isn't one of those things you get to just push the button on. And in Aria's case, things are dire. Because any time someone asks a question, no matter what, she has to answer it. So she's learned to wear headphones and listen to music to keep from hearing others, and when she does hear their questions -- and people ask a stunning amount of questions every day -- she tries to mumble the answers. Being compelled to reveal truthful answers has already brought her way too much trouble (like, answering where a straying husband is, or what a boy sees in another girl, ouch!) As Aria comments about her lack of friends at school, "Who wants a friend who only speaks the truth?" So it's a complete and surprising accident when one of the most popular girls in school asks a question that Aria can't help answering, a reply to Jade's despair: "Some things can only be confided to the earth." Not that Aria knows what that's supposed to mean (prophecies are often metaphorical or weird). But Jade seems to get it, and for a moment, school isn't such a desperate place. Until Jade is found missing, then dead, and Aria -- of course -- can't help replying if people ask her about the death. Soon the police and then Jade's two boyfriends are after Aria, and at least one of them may have a dangerous motive for calling her and inviting her into something she barely grasps. Go ahead, buy a copy for the "young adult" in your life. (It's from Soho Teen, sibling to Soho Crime.) Just make sure you have enough time to read it yourself, before you give it away. A murder from 1997 -- solved but not really cleared away -- is going to dog Detective Inspector Alex Morrow's current effort to keep a mobbed-up murderer jailed in Glasgow. But she doesn't know it yet, as RED ROADS opens with her court testimony and an unlikely stirring of friendship with Anton Atholl, defense attorney for the notorious Michael Brown. In fact, it's Alex who's sweating and nervous in court this time, but she pulls herself together and does a competent job of testimony. Back at her boss's office, a shocking discovery threatens to completely derail the case, though. The incarcerated defendant's fingerprints have just been identified -- at a current crime scene. Word of this could do much more than let Michael Brown off his current charges; it could derail all the past convictions related to him, as well as to the prints lab. Mina ramps up the tension and emotion by exposing the reader, in chapters sandwiched between Alex's experience, to what took place when a 16-year-old sexually abused girl went to prison back in 1997 for a knifing murder -- on the same night that another such murder took place. It will be a long reach within the book's tense timeline until DI Alex Morrow realizes that there are people from the old case, tangentially involved with the new one. This is the fourth Alex Morrow investigation (although it appears the publisher has "issues" around title number three and isn't mentioning it; go to the author website for the full listing, http://www.denisemina.com/writing). If you're already hooked on Mina's Glasgow noir, this one may be a hair gentler in terms of gore than others -- but emotionally it packs multiple punches and captures the double-binds of poverty and deprivation that feed back into cruelty. 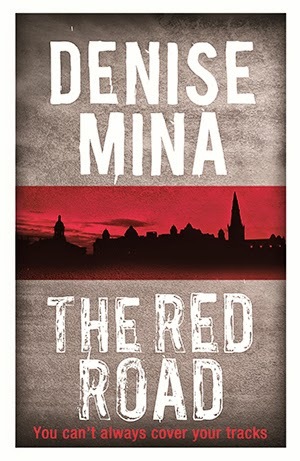 And if you haven't yet sampled Mina's other titles (which also include other investigators), this is actually a really good place to start, rich with imagery and layers of connection. I was sorry to turn the last page. Agatha Christie was right -- small-town life is a perfect stage for murder mysteries. And Liz Mugavero, in her second "Pawsitively Organic Mystery," gives us an amateur sleuth who's driven to solve crime when it affects that people she cares about. Kristan "Stan" Connor is curious, ambitious, honest, and will do just about anything for her friends and neighbors in the little Connecticut town of Frog Ledge. Owner of a relatively new business providing homemade, organic pet foods (often helpful in clearing up allergies and intestinal ailments of the dogs and cats whose owners will try them), Stan's quickly expanding her services in the community. 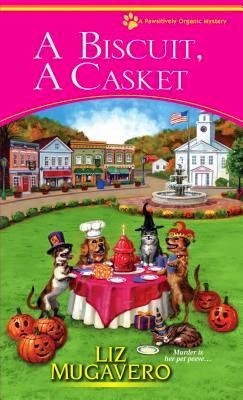 As A BISCUIT, A CASKET opens, Stan's just arriving with the chow for a very cute costumed pet birthday party, to be held at a local dairy farm that's also diversifying. In fact, in addition to the pet party, there's a Halloween-themed tour of the farm's clever "corn maze" to delight adventurous locals and tourists. But Stan never has a chance to serve her doggie delights that evening, because shrieks and chaos erupt when one of the married owners of the farm is found dead in the maze, a corn-chopping tool thrust into him in skilled and murderous fashion. As the only person in the crowd with experience of what ought to happen at a crime scene (see Mugavero's first in the series, Kneading to Die), Stan takes action to keep the crowd back and dials 911. The major drawback to that action the the local police investigator already knows Stan and isn't too impressed with this recent resident of the town -- "Stan pulled her phone out of her pocket. Noticed her hand was shaking. Great. Another call to Trooper Pasquale about a dead body." Stan's determination to be a good neighbor leads her to agree to help the newly widowed farm owner to look into why Hal Hoffman's been killed and who's done it. Good thing she has a newly hired baking assistant for her pet treats already ordered, but there's still a lot she has to handle on her own. And with the abrupt arrival of her not-very-happy mother to pay a visit, a potential boyfriend who keeps running into her during the wrong moments, and possible underworld connections to the murdered farmer, the pressure never lets up. There are plenty of bouncing dogs and well-grooomed cats in here, as well as cows (and their manure) -- but most of all the book draws its charm from Mugavero's well-created sleuth, who's smart enough to ask the right questions, again and again, until the answers start to line up. I enjoyed all the twists, and just enough scary moments to keep the plot lively without too much gore. This is a delightful "amateur sleuth" traditional mystery, crafted by an author who understands the classic mystery apparatus, and deftly weaves it into a small town that Dame Agatha would have enjoyed very much, I'm sure! Hurrah for Stan Connor and this growing series. Sign me up for the next book!